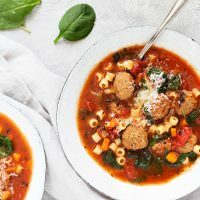 Easy, delicious, hearty and vegetable rich, this soup is made easy with store-bought Italian meatballs. Start with frozen, fully-cooked meatballs or pre-cook fresh meatballs before adding to soup. If you can't find fully cooked frozen Italian meatballs, you can use fresh and pre-cook them before adding to soup.